Dude! Put some flowers in your hair! Flowers are everywhere nowadays. We Swedes go crazy with making flower hair pieces on midsummer eve. But this is a fashion statement that I think works all summer long! Yes! When was the last time you went to visit a deceased relative? We live close to a church and every sunday morning people come with flowers or candles for a loved ones graves. I really like that. But I´ve noticed that most of theses visitors are over 50 years old. How about us 30-something-folks. Why are we not frequent grave decorators? Or maybe you are? While out driving this summer stop by an old relative or friend that is no longer with you and say hello. Protect your self like a true champion! If you are anything like Rocky you will be showing a lot of skin this season. Please be responsible and cover yourself with sunscreen. Put a foot print in your pocket. Summertime usually entails lots of visiting new places and spontaneous shopping and so on. It is sooo annoying finding something cute for your kids and not having them along to try it out. Shoes especially, I find it so hard guessing their size just by looking a the shoe. So I try to keep an up to date footprint in my purse, that I can measure . This is what it looks like at the moment. the shoe print is the most brilliant idea IN THE UNIVERSE! I am glad you like it Melissa! Right now I´m in Copenhagen and just because I took the footprint out and photographed it I totally forgot to bring it. Men jösses va fin hon är, Viola! och Rocky sen då, han ser så ledsen ut att man vill ge honom en bamsekram. Kollijox: Ja men det blir bra igen i slutet. 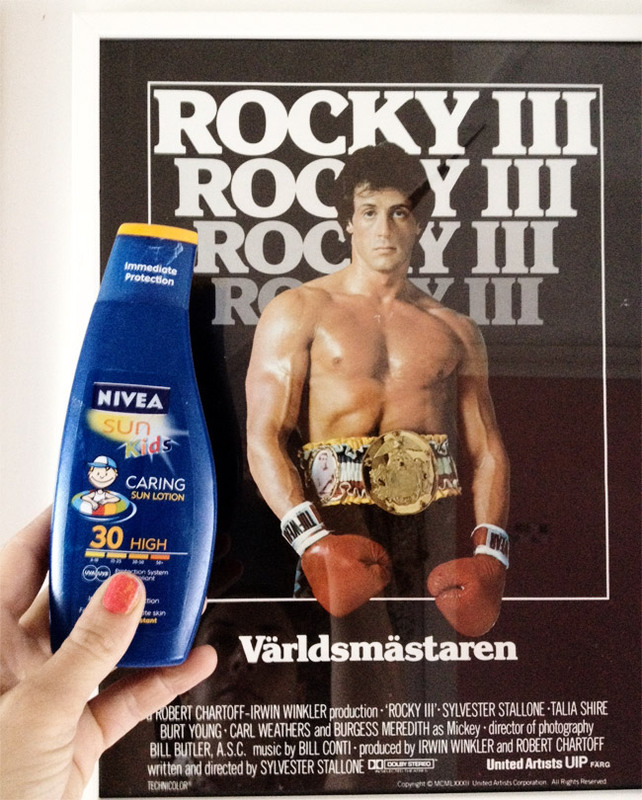 För Rocky alltså. Det är bara lite ledsamt i början. My mum was buried on a graveyard in a forrest. I love to sit under the tree next to her grave, listen to the birds, feel the sun shining through the leaves and imagine that I could still talk to her. Unfortunately I live now 700km away and so I think of her, while I’m lighting a candle in a church, while I’m watching old fotos, during a trip with the car (it was hers) or when I see something/somebody who reminds me of her. You see: some people still think of the people, who were gone… but not always at the places, where they were buried! But you are right: today I will buy some flowers and put them near my favourite foto of her. Oh Anja! Thank you so much , what a lovely comment. And you are so right of course! !